Drive through city neighborhoods to check out almost 150 traffic control cabinets turned urban art project with Mini Murals all over Houston. 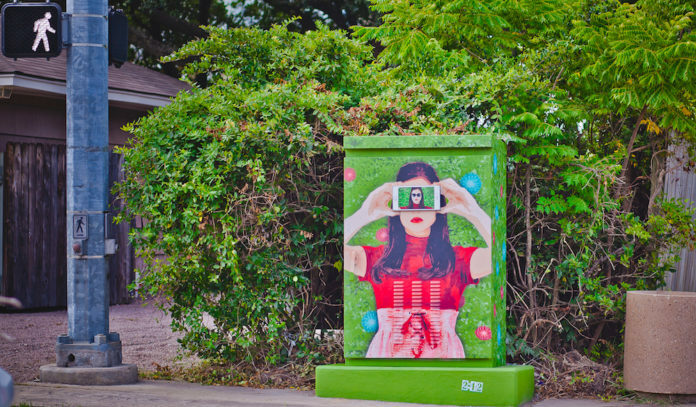 Presented by Up Art Studio, the Mini Murals project has been reimagining Houston’s nondescript electrical boxes as blank canvases, inviting local artists to make their own colorful marks on Houston’s urban landscape. Hometown tourists and visitors can expect to spot the likes of a spaceship blasting into liftoff at Telephone and Westover on the Southside, a smiling sun and moon at West Airport Boulevard and South Gessner, Frida Kahlo’s powerful gaze at Irvington and Cavalcade on the Northside, or the notable graffiti of Gonzo0247 at Spring and Sawyer Street near the Heights. 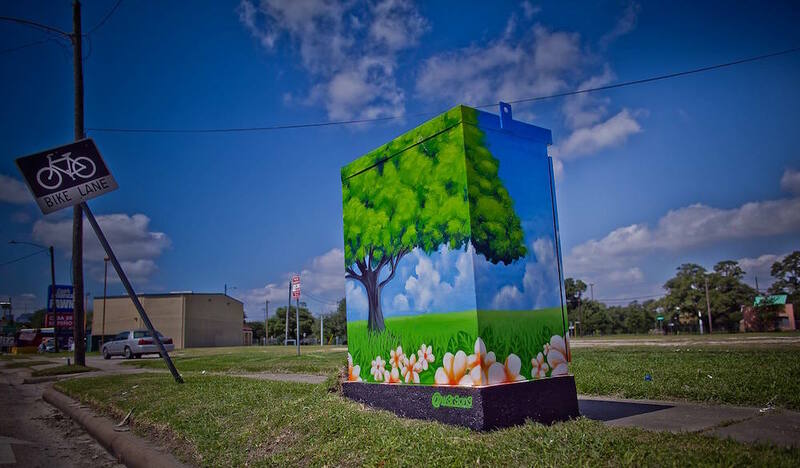 With more than 2,400 traffic control boxes in Houston, the project is brimming with creative opportunity to add vibrancy across the city. With help from Houston Arts Alliance, Fresh Arts, and the City of Houston, the project was greenlit in 2015 and kicked off with 31 traffic signal control cabinets. By January 24, 2017, the total number of Mini Murals had already exceeded 149 and continues to grow. With more public art outside the loop than ever before, the project has further established civic identity to Greater Houston through the beautification of neighborhoods. It doesn’t hurt having something colorful to think about while waiting for the stoplight to turn green too. Don’t be afraid to take photos and show off your neighborhood pride. Explorers are encouraged to take photos and use the hashtag #MiniMuralsHou on social media. Remember, Mini Murals are typically located at busy intersections so be careful while seeking that perfect snapshot. Click here to locate each Mini Mural on an interactive map. 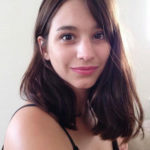 Locations: Locations vary around Greater Houston. Click here to use Mini Murals’ interactive map. Parking: Street parking is available in most surrounding areas, but practice sound judgment and caution. Given area traffic, some Mini Murals are more accessible than others. Parents should be mindful of their children if planning to visit Mini Murals on foot or for photos.